What is the difference between InZennio Z41 and Z41 Pro/Lite? Z41 Pro/Lite are the new models that replace InZennio Z41 in our catalogue from now on. The 3 devices are physically equal (excepting Z41 Pro/Lite include 2 analog-digital inputs), but starting from the application program version 2.2, Z41 Pro/Lite have been improved with new important functionality such as twelve general-purpose control pages, holiday calendar, water and gas monitor, four-byte indicators, new specific fan speed control, error log, light intensity regulation on RGB/RGBW controls... For further information, see the Z41 Pro or Z41 Lite manual. Moreover, Z41 Pro allows IP connection for smartphone/tablet control with Z41 Remote app (available for iOS and Android) in the same way as InZennio Z41. However, dinamic IP is necesary for both devices to connect to IP network. No, the application program developed for the Z41 is only compatible with ETS4 or ETS5. 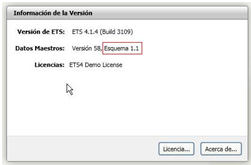 I cannot import the application program for the Z41, the ETS4 shows the message “The version of the Scheme is not valid", what can I do? May I install the Z41 horizontally? May I use the KNX bus voltage (29VDC) as the additional power supply of the Z41? Do I need an additional KNX power supply as external power supply for the Z41? What is the total consumption of the Z41? External power supply: the maximum consumption at startup is 160 mA (with 12 V), 76 mA (with 24 V) or 64 mA (with 29 V), but in standby, its consumption is reduced to about half of this figure. The Ethernet port built into the Z41 may be used to upgrade its firmware, and for the remote controlling of the Z41 via IP from devices such as smartphones or tablets. When having several touch screens Z41 in the same installation, How is recommended to configure the time/date sending period? It is necessary to configure just one screen in the installation to send time and date periodically to the bus, disabling in the remaining devices the parameter “Time/Date Sending Period” that can be found at MAIN CONFIGURATION/ General. Is it possible to disable the temperature and time displayed at the top of the screen? Yes, it is possible to disable the display of this information through the GENERAL setting parameters independently. This is possible by enabling this option in the GENERAL setting parameters. It is possible to save a log of the values ​​received in indicator controls of 1 or 2 bytes simply by enabling this option via the "Save Log?" parameter. Then, pressing on the indicator will open a pop-up window that will display graphically the values received in this indicator over time. To use this “Energy Monitor” control in Z41 Pro/Lite 1.1, it is necessary to enable the monitoring channels via the “Energy Monitor Objects” tab that you will find in the MAIN CONFIGURATION section. For each channel, four objects will be created: “Power”, “Energy”, “CO2” and “Cost Estimation”. Starting from the 2.2 version, it is not necessary to enable the channels since these functions are enabled in each box configuration. When configuring the 2-button control, it must be taken into account that the icon selection parameter does not assign functionality to the button. The icon is independent of the value sent. All the 2-button controls have a parameter called "Action" that allows exchanging the value sent to the bus between the left and right buttons. How can I schedule a Climate System timer? Is it possible to do a presence simulation with Z41? Z41 does not have that specific function; however, a similar functionality can be created by programming weekly and daily timers, and setting different sequences to simulate presence. In addition, Z41 allows users the remote control through smartphone and tablet, having the full control of the installation. This function allows a critical alarm system monitoring (i.e. gas sensor) to check its proper working in the installation. In this case, the function waits for a value reception to confirm that the system is working properly. If this value is not received within the specific time parameterized in the ETS, the alarm goes off warning users of a possible problem in the device. The Z41 usually gets hot during its programming in such a way that the real temperature is distorted during this time period. The Z41 will recover the real temperature once it returns to its standby status. Furthermore, supplying the Z41 with a voltage value or another can cause variations in the measurement of the temperature; however, the temperature displayed is automatically calibrated by selecting the “Power Supply Voltage” parameter properly. Can the temperature measured by the internal sensor of the Z41 be sent periodically to the bus? Yes, within the parameters of the Z41, it is possible to choose a cyclic sending period of the temperature measured by the internal sensor with a range between 10 and 1000 s.
Can the Z41 PRO be controlled by using an infrared remote controller? Can I control my Z41 PRO from my smartphone or tablet? Yes, it is possible to control your Z41 from your smartphone or tabled with Android or iOS. Is it possible to receive Z41 PRO notifications in my smartphone or tablet? Is it possible to use Z41 PRO as a KNX-IP interface for programming or monitoring? How can I control Z41 PRO remotely using my Smartphone or Tablet? Can I control my Z41 PRO from a Smartphone or Tablet connected to the same local network but without access to Internet?